Very runnable single track with a small section of technical rocks (Lakeside) on the 100 mile and 50 mile courses. Camping options on the island and close to the race start are plentiful and next to nothing in price. There are also hotel options near Syracuse if camping isn’t appealing to you. 50 & 100 Mile – Crew access isn’t advised (as mentioned above) for the first 19(ish) miles. White Rock and Split Rock loops are hikeable, but aren’t necessary. After that, crew can access their runners quite often at the start/finish, Mountain View, Frary Peak and Ranch aid stations. Aid stations have all the essentials needed for an ultra. I don’t recall any specialty food items (Non-GMO, gluten free, free range chickens, grass fed beef etc…) but you should have all you need to get you from point A to point B. Jim and his volunteers have their aid stations dialed in year after year. Various hot foods are also available for those lucky enough to run the 100 miler during the night. 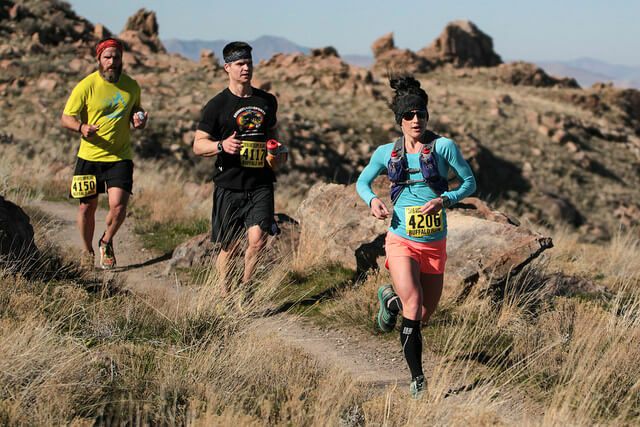 The Buffalo Run is a Utah staple for early season racing. Jim Skaggs (RD) has managed to keep the race feeling low key, even with increased numbers over the years. The 100 miler starting on Friday is even more low key with roughly 50 participants. The Saturday races and start finish area has a great atmosphere where runners are encouraged to stick around and cheer for finishers while enjoying the homemade buffalo stew. 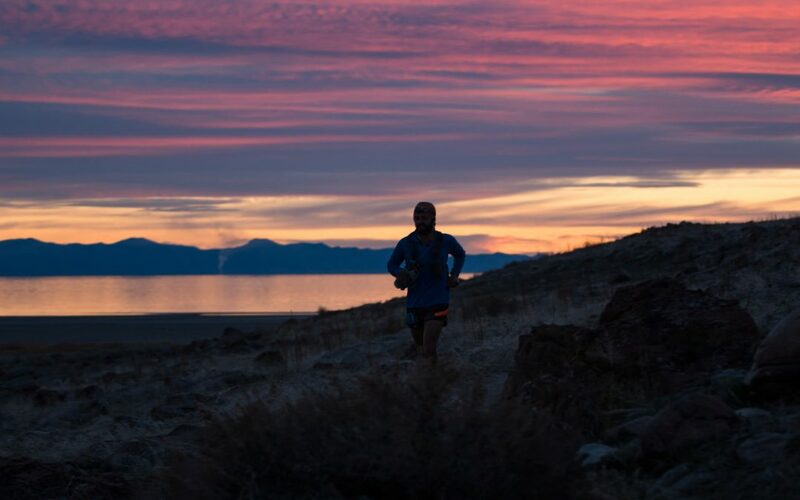 The Antelope Island Buffalo Run is an absolute favorite of mine. This year will be my 6th running of the event (100 3X & 50 2X) and will continue to be on my list of races year after year. The race itself features very runnable trails which can be harder to find in the landscape of mountain races on the Utah trail running scene. While the scenery on the Island is very different from trails along the Wasatch Front, they have their own desolate style of beauty. The 100 miler is a great 1st 100 attempt for anyone wanting to try the distance or go for a PR. 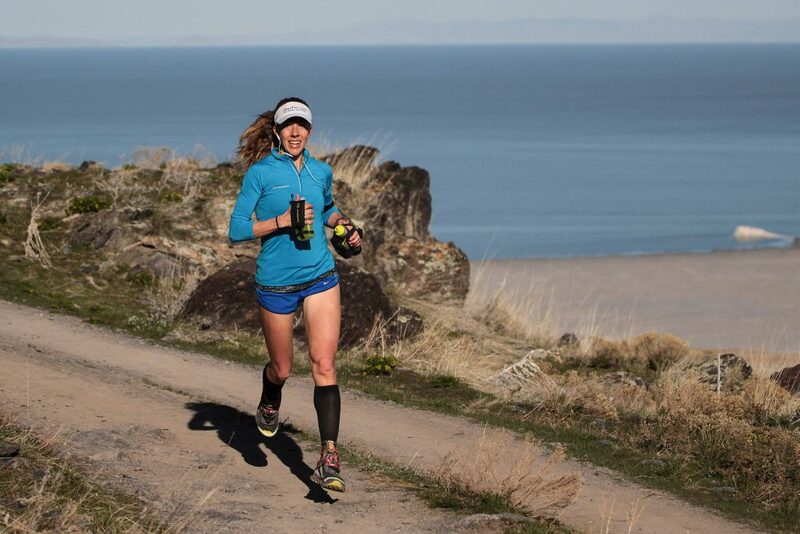 While the 100 mile distance is essentially a double loop of the 50 mile course, the Noon start time on Friday allows for runners to see the course in the daylight and the nighttime. My love for this race is hard to adequately describe in this sort of format. Please feel free to check out my last four years of race reports and I hope to see everyone out on the Island this year!